An 11-month-old boy presented to the emergency department with non-bloody, non-bilious emesis. The patient was diagnosed with gastroenteritis and sent home. No imaging was performed. The patient returned to the ED the next day with persistent emesis, possibly bilious, and cramping. There were no additional positive signs or symptoms. Since the diagnosis of intussusception was suspected, an ultrasound was requested. 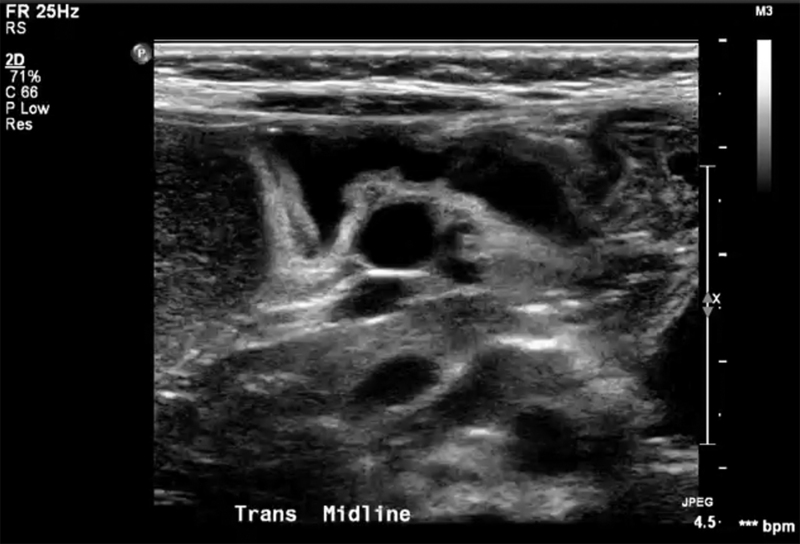 No intussusception was identified on ultrasound. Instead, cine imaging showed swirling of the bowel and mesenteric vessels around the superior mesenteric artery (SMA) (Figure 1 — cine clip), with adjacent dilated mesenteric venous collaterals (Figure 2). There was interruption [“cut off”] of the SMA, which was supplied distally through vascular collaterals (Figure 1 and Figure 3). The appendix was also seen in the epigastric region (Figure 3), confirming the abnormal position of the cecum. Sagittal and axial volume-rendered reconstructions from a CT scan performed on a different patient with a midgut volvulus demonstrated cutoff of the SMA with reconstitution distally through vascular collaterals (Figure 4) and swirling vessels around the SMA (Figure 5). 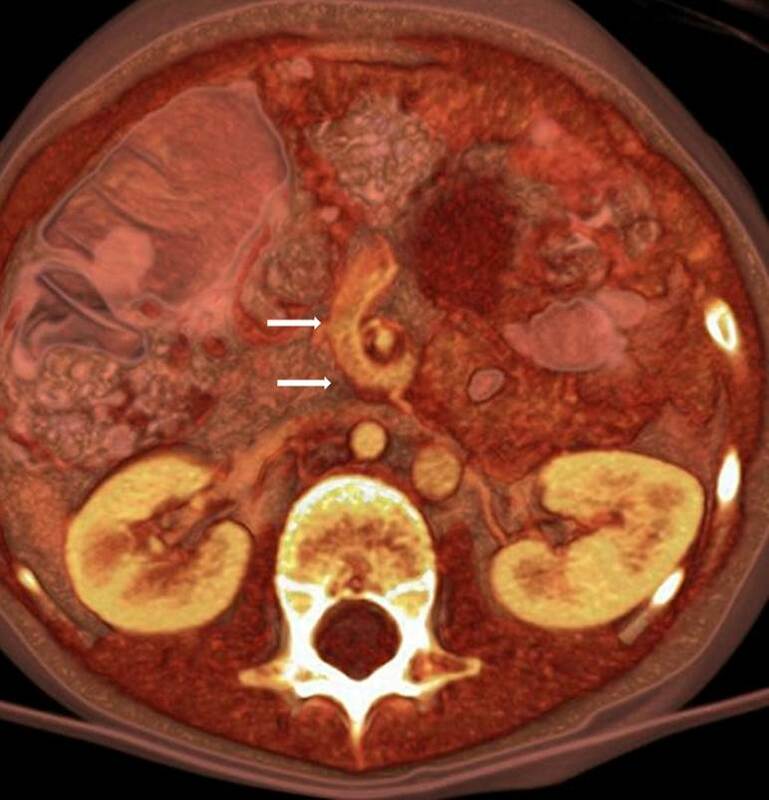 Based on these findings, a diagnosis of midgut volvulus was rendered. Upper gastrointestinal series (UGIs) have traditionally been considered the imaging test of choice in a newborn or infant with bilious emesis.1 However, the reported sensitivity of UGI in the diagnosis of midgut volvulus ranges from 51% to 79%.2,3 This low level of sensitivity is concerning considering the devastating consequences of missing this diagnosis. Urgent UGIs are almost always performed to exclude midgut volvulus, since that condition is an urgent diagnosis while malrotation without volvulus is not. Ultrasound is both an effective and sensitive way to diagnose malrotation and midgut volvulus. The sensitivity ranges from 92% to 100%.4-6 Previous reports have focused on identifying the “whirlpool sign;” ie, swirling of the mesenteric vessels in clockwise direction, as the transducer is moved craniocaudally. This presentation will focus on how we use ultrasound to diagnose midgut volvulus. Diagnosing midgut volvulus by ultrasound is usually straightforward. Identifying the SMA is the necessary first step, since midgut volvulus is centered around the superior mesenteric artery. 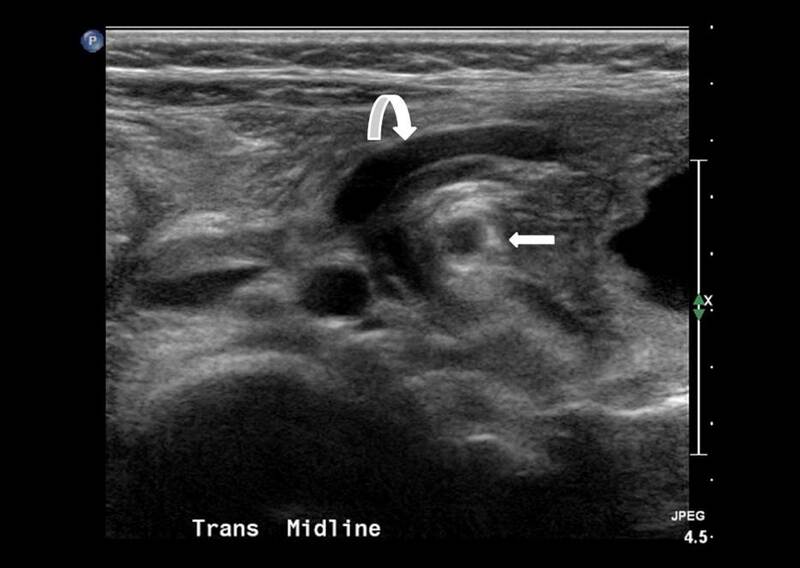 The sonographer follows this vessel from its origin in the transverse plane, continuing as caudad as possible, at least past the branches that supply the jejunum. If there is no swirling of the bowel, mesentery or mesenteric vessels around the SMA, and there is no cut off of the SMA, then midgut volvulus can be confidently excluded. The transducer frequency utilized depends on the size of the child. In general, a high-frequency transducer [between 7 and 12 MHz] is appropriate for newborns and infants. It is important to record a cine clip, as it is often difficult to appreciate the swirling on a static image. In our experience, the relationship between the SMA and SMV is not important, since the SMV is often compressed at the level of the midgut volvulus and therefore not identifiable. Instead, dilated venous tributaries and collaterals are usually seen. Therefore, identifying and following the SMA is sufficient to diagnose midgut volvulus. If the SMV is compressed, we believe that midgut volvulus should be suspected; careful review of the cine clip may reveal subtle swirling around the SMA. It is also important to note that the SMA is often “cut off” at the level of the volvulus and reconstitutes distally (Figure 1 – cine clip). In our experience, Doppler imaging is not necessary for diagnosis, although it may be useful in identifying the SMA in certain cases. Doppler would demonstrate the whirlpool sign, which may increase the confidence in the diagnosis. In order to confidently diagnose a midgut volvulus on US examination the operator must be familiar with the normal anatomic appearance of the mesenteric vessels and duodenum in neonates and young children. This knowledge of normal anatomy can be obtained by performing abdominal ultrasounds in this population for other reasons. The exam is usually short, and we believe it takes less time than an UGI series. Furthermore, it can be performed at the bedside in unstable patients. In some circumstances, identifying or following the SMA may be difficult because of interposed bowel gas or complex anatomy, such as that encountered in heterotaxy syndromes. Using different acoustic windows such as the liver, lateral decubitus position, and getting familiar with the case through previous plain X-rays or UGI exams may be helpful. In cases where the diagnosis is not possible or is uncertain, an UGI should be performed. Although this may be controversial, we feel that abdominal ultrasound should be the first imaging examination when midgut volvulus is suspected. An UGI exam should only be performed when the ultrasound exam is equivocal or non-diagnostic. Seashore JH, Touloukian RJ. 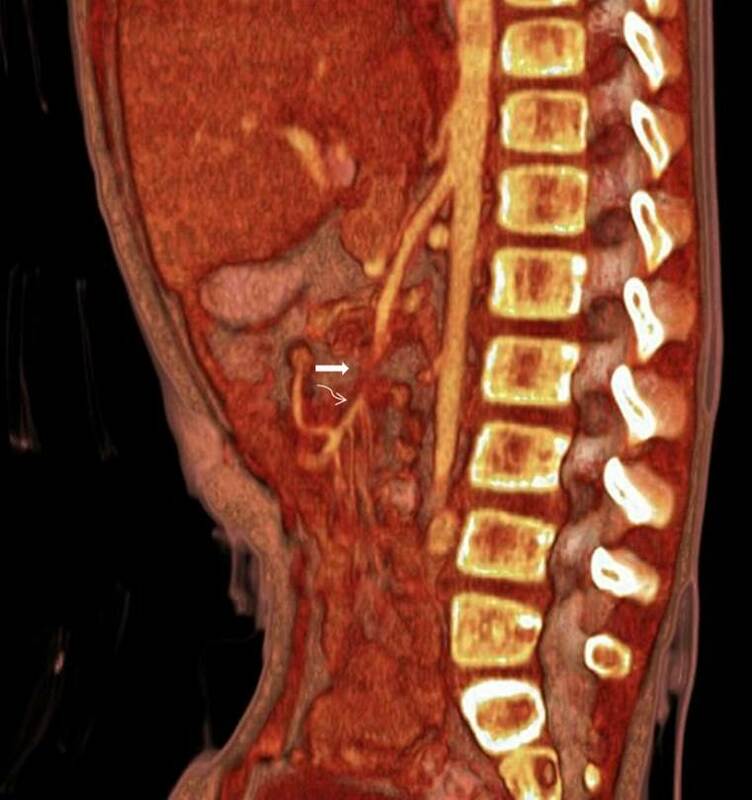 Midgut volvulus. An ever-present threat. Arch Pediatr Adolesc Med. (1994:148:43-46. Sizemore AW. Diagnostic performance of the upper gastrointestinal series in the evaluation of children with clinically suspected malrotation. Pediatr Radiol. 2008; 38:518–528. Pracros JP. 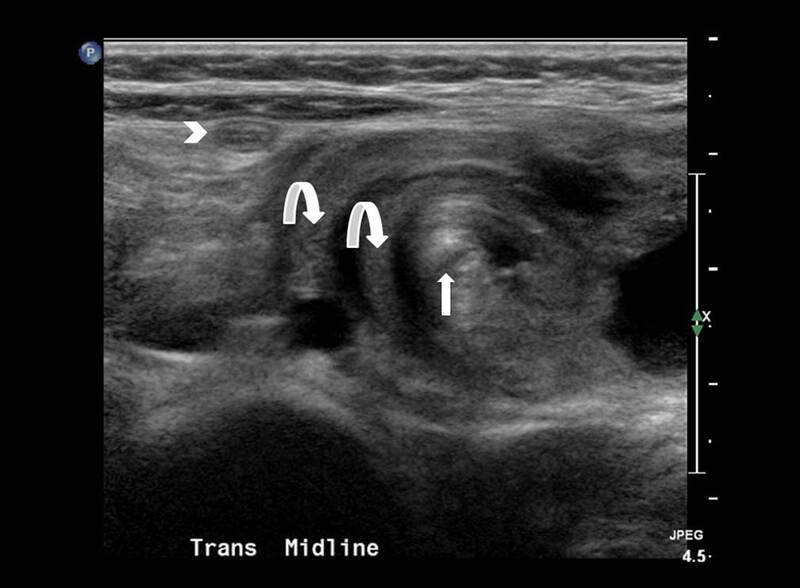 Ultrasound diagnosis of midgut volvulus: The whirlpool sign. Pediatr Radiol. 1992;22:18-20. Shimanuki Y. Clockwise whirlpool sign at color doppler US: An objective and definite sign of midgut volvulus. Radiology. 1996; 199:261–264. Patino MO Utility of the sonographic whirlpool sign in diagnosing midgut volvulus in patients with atypical clinical presentations. J Ultrasound Med. 2004; 23:397–401. Ultrasound diagnosis of midgut volvulus. Appl Radiol. Dr. Youssfi and Dr. Jorgenson are Pediatric Radiologists and Dr. Towbin is Radiologist-in-Chief at Phoenix Children’s Hospital, Phoenix, AZ.